Protect your customer’s property and assets with our powerful access control systems that are simple to manage and operate. Secure access systems replace locks with intelligently-controlled devices, and are operated by simply swiping an authorized card. These systems also provide data logs as to when and where a card was used. Card Readers can be installed in elevators, doors, community entrances, parking garages, and other areas. At Smart CT, our access control systems are easy to use, and deliver a safe working or home environment. The user-friendly software manages access privileges and data around the clock for a complete solution that meets customer’s needs. Increased safety by restricting or limiting access to an unauthorized person. You can remotely activate and deactivate access to the location. Access logs that record the time, location and name of the person that used the card. Significantly increase security since keys are easily duplicated, while an access card cannot be reproduced. Improves your branding and security since access cards can be imprinted with a logo or a photo to quickly identify authorized individuals. Say goodbye to lost or forgotten keys with an easy-to-install keyless smart lock. 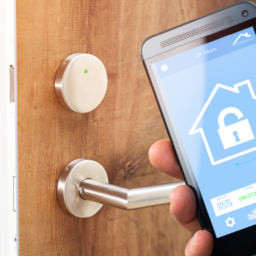 Smart locks offer more than just a keyless system. They connect with your home automation, alarm system, and allow you to control access remotely. With this system, you can also grant limited access by remotely locking and unlocking the doors with your fingerprint or from a website or mobile device to provide an additional layer of security. 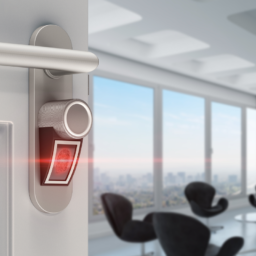 At Smart CT, our smart locks allow you to receive alerts, track who is entering or leaving, and give you the capability to integrate with an existing smart system. With a smart lock, you are given the choice of connectivity and the method of entry. Smart locks are compatible with smart home ecosystems such as: Nest, Apple HomeKit, RING and Wink.